Juneau tours don’t get more challenging, or rewarding, than this one! The Mendenhall Glacier Trek is not your everyday adventure, and neither is the challenging trek to get there, but what an experience when you reach the majestic Mendenhall Glacier and explore this eerie blue world of ice, from deep crevasses and moulins (steep shafts) to crystal-clear meltwater streams and emerald-green pools. You may even have the opportunity to enter a ghostly ice cave, depending on conditions, and to learn some mountaineering skills by using trekking poles and micro-spikes to climb your way up the ice! Your full-day adventure begins with a three-and-a-half mile trek through rainforest along the shores of Mendenhall Lake. At first easy, the trail grows increasingly strenuous until a final rock scramble takes you to the top, where you’ll find breath-taking views of the Mendenhall Glacier and surrounding peaks! From here, it’s on with your glacier gear and micro-spikes for a one-hour trek traversing the ice amid landscapes you really have to see to believe! For those up to the challenge and with the necessary physical fitness, the Mendenhall Glacier Trek is a truly awe-inspiring experience. Like our other Juneau tours, your adventure begins with pick-up from the cruise docks or your hotel and a scenic drive to the Mendenhall Valley and West Glacier Trailhead. At the trailhead, you’ll meet your expert guides and be fitted with a backpack containing all the gear you’ll need for traversing the glacier, plus food and water. Take it easy on the first mile as your guide leads you over a well-maintained trail through temperate rainforest. From here, the trail gains elevation and gets rougher with some steep, uneven sections and rock scrambling. Reach the top, take time to soak in the stunning views, then head across the final patch of bedrock to the edge of the glacier. With your glacier gear and micro-spikes on, it’s time to head out onto the icefield for the experience of a lifetime! The return trek may take a different route but will be just as strenuous as your hike up to the glacier. Of all the Juneau tours, this is the most physically challenging, but the rewards for your effort are stupendous! Don’t believe us? Just check out this tour’s Alaska shore excursions reviews! For less hiking, you might consider the Mendenhall Glacier Trek & Paddle. 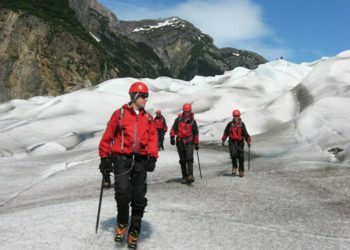 Or, for an exclusive and brand-new private tour, check out the Private Mendenhall Glacier Trek. Must be fit enough to hike for 7+ hours covering over 8-9 miles of strenuous terrain (see trip description above) carrying a 10-15 pound backpack. Answer: Because much of SE Alaska is a rainforest, these trips do operate rain or shine. Rain jackets and pants are provided on this trip. If weather conditions are unsafe, the trip will be canceled and we will provide a full refund. What can I do to prepare physically for this trip? Answer: Cardiovascular training is a must. You will be hiking approximately 8 miles roundtrip for 7+ hours on uneven terrain. Cardiovascular training will increase your endurance making for a more pleasant experience on the trail. In addition, get yourself out on a hike and choose trails that are uneven. We oftentimes get people who are in good physical condition (i.e. train at the gym daily, run several times a week), but struggle on the uneven surface because they are used to exercising on flat ground, which does not require much balancing and much use of the small muscles in the legs and ankles. What's the weather like on the glacier? Is it cold? Answer: Juneau temperatures during the summer are typically between 50 and 65 degrees, with an average of 56 degrees Fahrenheit (13 degrees Celsius). The temperature on the glacier is about 5 degrees cooler, but can feel up to 15 degrees cooler due to katabatic winds (cold downslope winds coming down the glacier). Please bring layers of clothing including a warm hat and gloves. Answer: You'll have a chance at the kayak base to use the restroom, but after that we will be entering the great outdoors. We recommend all guests follow 'Leave No Trace Principles' and should the need arise, we request packing all trash from the trip including toilet paper. If this is of concern for you, we recommend bringing toilet paper and a ziploc bag for easy packing. Answer: There can be up to 12 participants on this trip and there is a minimum of 2 guests for the trip to operate. With advanced notice we can accommodate larger groups on private tours. What is the surface of the glacier like? Answer: The area that we travel on is in the ablation zone, the section of the glacier that is melting and not covered in snow half the year. The surface is wet, a little bit dirty, slippery, and uneven with crevasses and seracs (towers/fins of ice) adjacent to and in our trekking routes. It is wet due to melting ice and from the meandering melt-water streams. It is dirty due to the movement of the glacier scraping the sides of the mountains, winds blowing dust and debris onto the ice, and 150 years worth of atmospheric dust settling onto the glacier. To prevent us from sliding while walking on the ice, we wear micro-spikes. The specific route taken on the glacier is selected by the guides to meet the ability and adventure level of the clients. Are we guaranteed to see ice caves? Answer: We don't guarantee ice cave visits. Because the caves are dynamic and change rapidly, visits are condition-dependent. Your guides will ultimately make the call whether or not it is safe to enter an ice cave.